Victoria is facing a worsening epidemic of buruli ulcer: here's what is known about the flesh-eating infection. This article was first published by The Conversation in September 2017. It has been updated to include recent statistics. Buruli ulcer, also known as Bairnsdale ulcer, occurs in many areas of the world, including Victoria. Besides the Mornington Peninsula, Australian cases have also been reported in tropical areas, including north of Mossman in Queensland, and the Capricorn Coast of Queensland near Yeppoon. In Victoria, the number of reported cases has increased. There were 275 cases in 2017 compared with 182 for 2016. There were 107 in 2015, and 89 in 2014. Buruli ulcer is a major public health problem in West Africa, where cases have been described in 32 countries and untreated ulcers can result in significant disfigurement and disability, particularly in children. How do you know it’s a Buruli ulcer? The hallmark of this infection is a non-healing sore, usually on the leg or arm, which slowly enlarges over weeks to months. In the very early stages, the infection may start as a red lump. The edges of the ulcer are often medically described as “undermined”, which means the dead tissue may appear to extend far beyond the actual ulcer on the skin surface. A child in the Ivory Coast shows his arm which has been damaged by Buruli ulcer in 2009. Ulcers are usually single, but they can be multiple or recurrent. Some patients can get a lot of swelling of the infected area, and sometimes this may affect a whole limb. Extensive tissue damage requiring amputation is rare in Australia, but may be required for very advanced infections. M. ulcerans is a distant relative of organisms that cause tuberculosis (Mycobacterium tuberculosis) and leprosy (Mycobacterium leprae). It seems that this organism can evade the body’s immune system by producing a toxin called mycolactone, which destroys immune cells. Without control by the immune system, the infection can proceed unchecked and cause progressive tissue death. When we look down the microscope at tissues infected with other bacteria, we usually see lots of white cells which cause inflammation. But in the case of M. ulcerans, the telltale absence of white cells is often an important clue to diagnosis. M. ulcerans infection was first recorded in patients in eastern Victoria in the 1930s. But over the past 15 years, cases have been moving westwards along the coast to the Bellarine Peninsula south of Geelong. Since 2012, cases have reversed back to the Mornington Peninsula southeast of Melbourne. Although cases can present at any time of year, more tend to present between June and November. A few patients only report very transient exposure, such as a weekend trip to the Bellarine Peninsula. From these patients, it is thought the incubation period (the period between getting infected and the ulcer appearing) is around three to five months. The reasons for where and in whom infection occurs isn’t clear. Circumstantial evidence seems to implicate mosquitoes, as the bacteria can be found in mosquitoes, occurs on exposed parts of the body where mosquitoes tend to bite, and seems to be associated with outdoor activities. So covering up and using mosquito repellents would seem to be the best preventative measures. Oddly, cases seem to occur in very specific areas – on the Bellarine Peninsula some towns seem to be “hotspots” whereas others are relatively spared. 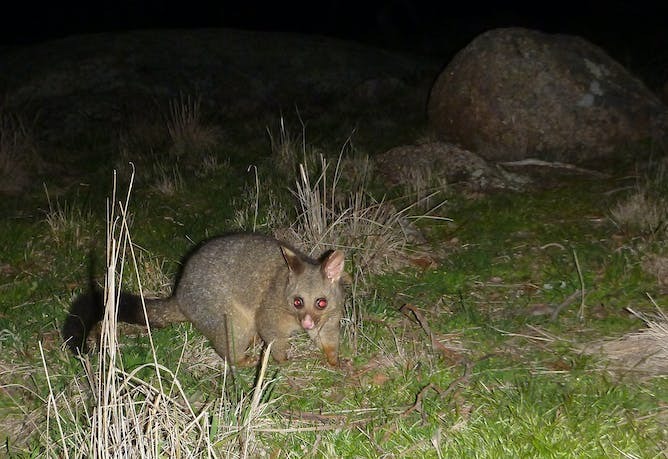 An intriguing lead that may partly explain this is the discovery that possums, and more specifically possum faeces, appeared to be infected, and sometimes without the possum apparently being unwell. Positive “possum poo” seems to occur where human cases occur. This suggests that M. ulcerans may be a zoonotic infection – this is where human cases occur as a “spillover” from what is otherwise an animal infection. Clearly this isn’t the whole story, as M. ulcerans infection occurs in regions of the world with different mosquito and animal species. Unfortunately, these infections don’t respond to the usual antibiotics for skin infection, and it isn’t uncommon to see patients who have been on several courses of antibiotics before a diagnosis is made. In the past, it was thought that all cases needed surgery, similar to that for skin cancer. In Australia, surgery to remove the affected tissue is still sometimes required, but most cases can be cured with long courses of antibiotics. The antibiotics used for M. ulcerans are usually reserved for other infections such as tuberculosis, which aren’t the first choice of treatment for skin infections. The use of treatment solely with antibiotics is being tested in a trial in Africa, and if successful would be good news for patients in regions where surgeons are scarce. Although the effectiveness of preventative measures is not confirmed, avoiding mosquitoes would seem to be the most prudent measure to prevent infection. This includes covering up exposed skin and using mosquito repellents in the warmer months. Get unexplained lumps and sores checked out, particularly if they persist for weeks or months. There is a long list of other conditions that cause non-healing ulcers which may also require medical attention, such as skin cancers and diabetic foot infections. However, Buruli ulcers are more easily treated before the infection spreads, so early diagnosis is important. That said, M. ulcerans is very slow growing, so there’s no need to panic. Make sure you let your doctor know if you’ve been in any of the affected areas – while this infection is on the radar of doctors in these areas, it may not be top of the list for those elsewhere.